Peanut butter is healthy, right?! 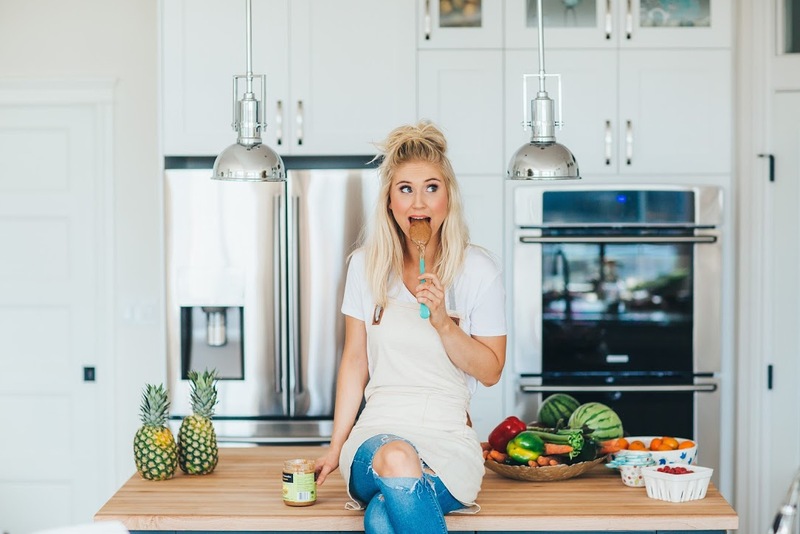 SOPHIE GRAY is an up-and-coming health and fitness guru with a powerful mission: helping women like what they see when they look in a mirror. I was steered in the direction of fitness when I started modeling. I initially started exercising to look a certain way, but over time that has shifted to doing it because it’s good for my body! What is your diet & fitness philosophy? I truly believe that we need to eat well and exercise because we love ourselves – instead of trying to become something we’re not. When we workout and eat clean because we love ourselves, we’re much more likely to stick with this lifestyle! What do you see as being the difference between being skinny and being healthy? We all metabolize food differently. That being said, being skinny but still eating McDonald’s and not moving your body is not healthy. Healthy is making a choice each and every day to take care of your incredible body. How can women create and maintain a sense of body positivity? Body positivity is a choice you have to make each and every day – not a jean size you fit into. Self-hatred and feeling unworthy has nothing to do with actual physical appearance. You can already be thin and still struggle with an eating disorder. You can be on the “curvier” side and have more confidence than a thin person in the media. I think it’s time we stop separating women between those who look like the “girls in the media” and “everyone else.” We should talk about how all women are beautiful, and how we’re all deserving of our own love. Can you briefly share a little bit about your 30-Day Self Love Challenge? My soon-to-be-available Free 30-Day Self Love Challenge is about forming habits to love yourself and taking the time each day to better your relationship with yourself. As mentioned, it is free, but you also have the option to pay a very low fee and get access to videos that go along with each topic, as well as access to an empowering private Facebook community group. What is one food women should add to their diets? Avocados – they contain all of the beneficial fats women need in their lives. What is one food women should remove from their diets? Soda, especially diet. Soda is doing nothing good for your body, and diet soda is even worse. How often and for how long should women exercise? I think women should make the habit of at least working out 2 times a week, and no more than 5-6 times. If you’re working out properly, you don’t need to be at the gym for 2 hours. What does your cheat day look like? I don’t love the phrase “cheat day.” I like to call it another day in my life because I think, mentally, the words “cheat day” are more damaging to your goals than the actual food you’re eating. If I want a cookie, I have one – just not every day. How often is it okay to have a cheat day? If you can truthfully say that you know you’re taking care of your body 80 percent of the time, then go ahead and enjoy that 20 percent of the time when you indulge in not-so-great food. In your opinion, what percentage of having a healthy body is the food you eat and what percentage is working out and fitness? I think a common percentage that’s cited is 80 percent nutrition and 20 percent exercise – and I believe that. You can’t out-train a bad diet. What’s the best piece of advice you have for women who are feeling frustrated when they aren’t seeing results from their diet or exercise plan? Rather than focusing on the physical results, focus on the more meaningful progress. You have more energy throughout your day? That’s a victory. You feel more clear-headed? Victory. You are more patient with your loved ones? Winning. You’re moving your body and eating green things? THAT IS PROGRESS! What are your best tips for women on-the-go who wants to stay on track, but might not have time to do a full workout or cook all of her meals? This lifestyle doesn’t have to be all-consuming – trust me, I get you. My guides have workouts that consist of 4 days a week for less than an hour. They also teach you all about meal prepping! They’re available on my website Way of Gray. Being a #GIRLBOSS is about empowering other women to know how incredible they are. It’s about building those around you up and choosing happiness each and every day. You’ve accomplished so much for being 21. What else is on your career bucket list? I’d love to be the next Oprah. Seriously. We don’t need an “aha moment” to know that Sophie Gray will go very far. For more information on Sophie’s Free 30-Day Self- Love Challenge and to get access to a free 7-day workout plan to give you a taste of Sophie’s programs, check out her website and follow Sophie on Facebook, Twitter, and Instagram.